When power is applied, it is directed to only one of the stator pairs of windings, which will cause that winding pair to become a magnet. One of the coils for the pair will become the North Pole, and the other will become the South Pole. When this occurs, the stator coil that is the North Pole will attract the closest rotor tooth that has the opposite polarity, and the stator coil that is the South Pole will attract the closest rotor tooth that has the opposite polarity. When current is flowing through these poles, the rotor will now have a much stronger attraction to the stator winding, and the increased torque is called holding torque. 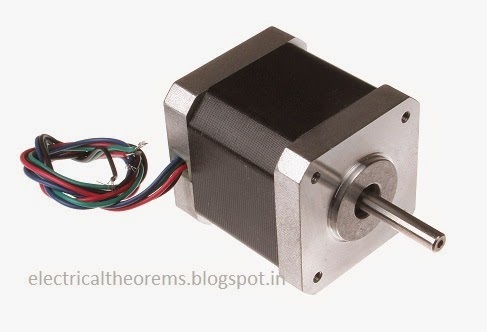 The stepper motor can be operated in three different stepping modes, namely, full-step, half-step, and micro step. The stepper motor uses a four-step switching sequence, which is called a full-step switching sequence which is already described above. In this sequence the first step has SW1 is on, and SW2,SW3 and SW4 are off. The sequence for the first step is the same as the full-step sequence. The second step has SW1 and SW2 are on and all of the remaining switches are off. This configuration of switches causes the rotor to move an additional half-step because it is acted upon by two equal magnetic forces and the rotor turns to the equilibrium position which is half a step angle. The third step has SW2 is on, and SW1, SW4 and SW3 are off, which is the same as step 2 of the full step sequence. The sequence continues for eight steps and then repeats. The main difference between this sequence and the full-step sequence is that the energizing sequence for half step is A A BB BC CC DD DA. The full-step and half-step motors tend to be slightly jerky in their operation as the motor moves from step to step. The amount of resolution is also limited by the number of physical poles that the rotor can have. The amount of resolution (number of steps) can be in-creased by manipulating the current that the controller sends to the motor during each step. The current can be adjusted so that it looks similar to a sine wave.sent to each of the four sets of windings is timed so that there is always a phase difference with each other.The fact that the current to each individual phase increases and decreases like a sine wave and that is always out of time with the other phase will allow the rotor to reach hundreds of intermediate steps. In fact it is possible for the controller to reach as many as 500 micro steps for a full-step sequence, which will provide 100,000 steps for each revolution.